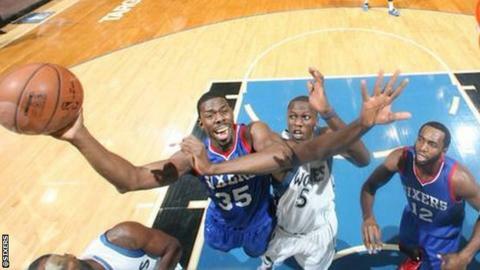 Philadelphia 76ers avoided equalling the worst ever start to an NBA season by beating Minnesota Timberwolves 85-77 in Minneapolis. Michael Carter-Williams scored a game-high 20 points and Robert Covington contributed 17 as the 76ers recorded their first win in 18 matches. "To get this win for the city of Philadelphia, it felt great," said forward Nerlens Noel. The New Jersey Nets set the record with 18 straight defeats in 2009-10. Minnesota's loss was their 13th of the season, giving them the worst record in the Western Conference.